rom Pennsic it was off to the 2011 Western Martial Art s Workshop, in Racine, Wisconsin. Founded in 1999, WMAW has become the premiere North American venue for students and instructors of the western tradition to gather and cross-train, drawing instructors and students from three continents. Besides being the oldest event of its kind, WMAW is unique in being a retreat, set at the picturesque, DeKoven foundation in Racine, WI, a walled, Anglican retreat center overlooking the shores of Lake Michigan. The Foundation began as Racine College in 1852, and was the first college built west of the Appalachians. During the Western Martial Arts Workshop, a somewhat rowdier bunch fill the campus and one can only wonder at what Dr. DeKoven would have thought. This year was the largest and busiest Workshop ever, selling out within a week of registration opening! 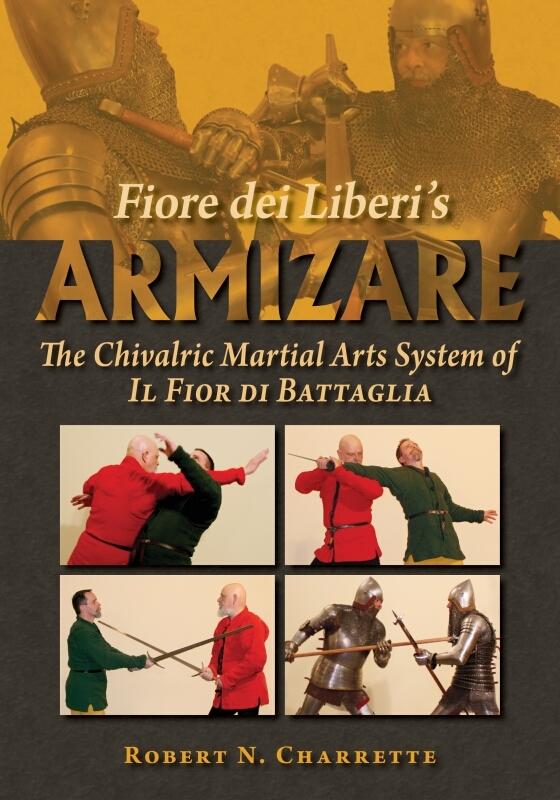 Freelancers Greg Mele and Christian Tobler were pleased to present four different classes on the German, Iberian and Italian martial traditions. Christian reprised his Glasgow Messer class from Pennsic, and then also took a new look at the Inverted Left Hand Grip in German Longsword Play based on research and discussion with our friend and colleague, Mr. Dierk Hagedorn of Hammaborg. 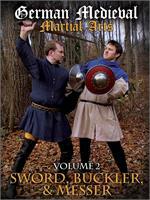 Most martial arts begin by teaching the student how to defend, and the medieval material is little different. This is because it can be very dangerous to break measure and initiate an attack against a trained opponent. Nevertheless, the reality of combat means it is sometimes necessary to attack first. This was the premise behind Greg’s How the Hell do I Attack? Entering Combat in the Swordplay of Fiore dei Liberi. Greg’s second class was Monte’s Levata: a Simple Cutting Sequence with Many Applications. Writing in the late 15th century, Pietro Monte was likely a Spaniard in Italian service. His fencing instructions are somewhat unique in that they are not an instructional manual, but rather short chapters of tactical advice on a broad range of weapons. Book I, Chapter XIV of the Collectanea forms Monte’s instruction on the two-handed sword, and teaches a simple combination of actions called the levata, which Monte says is at the root of the art of fencing. The class looked at Monte’s instructions as a solo cutting exercises with serveral variations, then as a series of partnered drills that show how to apply the same sequence as both attacker and defender. Finally, we looked at the levata as it might be used with disparate and variant weapons. 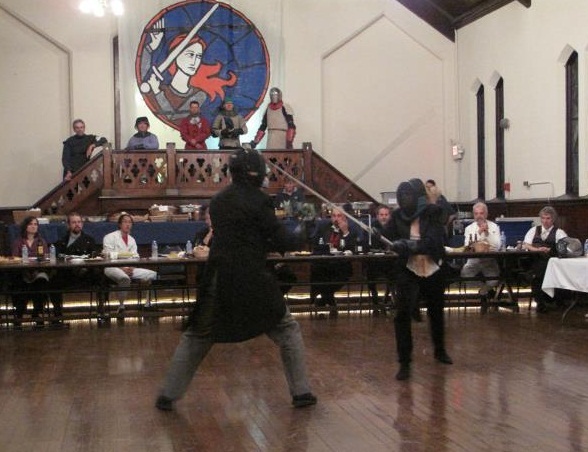 I’m not sure if the class instruction itself was a big hit, but everyone seems to love swinging around 5’ swords, particularly when dressed in tail coats…. Most martial arts authors are amateurs – as writers, photographers or both. While digital media has made the ability to communicate easier than ever before, the question of how best to visually represent the martial arts on the written or printed page still exists today, as it did 400 years ago. Indeed, if anything, technology can make the problem worse, not better! Photography is still truly an art and science all its own, and creating images that not only look good, adhere to basic photographic principles, communicate effectively, and still meet the demanding technical criteria of the professional publisher/printer, can prove daunting. Finally, life – and graduate school – intervened and prevented Tom from attending this year’s workshop, but Bill Grandy of the Virginia Academy of Fencing was kind enough to step in and teach his classes on Bolognese sword and buckler and the relationship between Gioco Largo and Gioco Stretto. Thanks, Bill, for helping a brother out, and doing it so ably! The Freelancers were hardly the only instructors at WMAW; we were among a cast of nearly thirty teachers from three continents, including well-known names and new faces, such as Bob Charrette (Forteza Historic Swordwork Guild), Sean Hayes (Northwest Academy of Arms), Rob Lovett (the Exiles), Roland Warzecha (Hammaborg), Guy Windsor (School of European Swordsmanship), and Tony Wolf (Bartitsu Society) teaching classes as diverse as Gladiatorial combat, Bartitsu, German sword & buckler, French cane fighting, and good, old-fashioned American Catch Wrestling.